Then he quits. Except a few, The few with passion. The few who care. Those kids lean forward and begin to play. They play as if they care, because they do. If you do a job where someone tells you exactly what to do, he will find someone cheaper than you to do it. The bottom is not a good place to be, even if you’re capable of getting there. There’s a significant cultural distinction between a high school drop-out and a Yale graduate. If school’s goal is to create a foundation for a common culture, it hasn’t delivered at nearly the level it is capable of. We spend a fortune teaching trigonometry to kids who don’t understand it, won’t use it, and will spend no more of their lives studying math. We don’t need more of what schools produce when they’re working as designed. to find the edges and the weird, and to cater to what the individual demands instead of insisting on conformity. We build a better society when our peers are educated. Democrace was pretty new, and the notion of putting that much power into the hands of the undeducated masses was frightening enough to lead to the push for universal schooling. Sure, education is expensive, but living in a world of ignorance is even more expensive. Does the curriculum you teach now make our society stronger? …be ashamed to die until you have won some victory for humanity. Shool’s industrial, scaled-up, measurable structure means that fear must be used to keep the masses in line. There’s no other way to get hundres or thousans of kids to comply, to process that many bodies, en masse, without simultaneous coordination. hang out with, and what our parents do. Our culture has a dreaming problem. Dreamers can be impatient, unwilling to become well- rounded, and most of all, hard to fit into existing systems. Notice that these kids were okay with not actually being famous—they were happy to be the assistant of someone who lived that fairy tale lifestyle. Is this the best we can do? Have we created a trillion-dollar, multimillion-student, sixteen-year schooling cycle to take our best and our brightest and snuff out their dreams—sometimes when they’re so nascent that they haven’t even been articulated? Do you need a competent call-center employee? 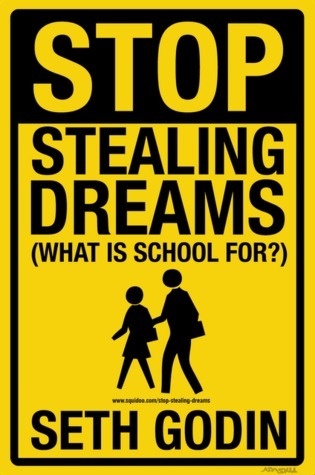 School is good at creating them, but it’s awfully expensive. Do we really need more compliant phone operators, and at such a high cost? Is this the right plan? Is this the best way to produce the culture and economy we say we want? Dreaming of being picked—picked to be on TV or picked to play on a team or picked to be lucky—isn’t helpful either. Instead, our chaotic world is open to the work of passionate individuals, intent on carving their own paths. School belongs to parents and their kids, the ones who are paying for it, the ones it was designed for. It belongs to the community, too, the adults who are going to be living and working beside the graduates the school churns out. Too often, all these constituents are told to treat school like an autonomous organism, a pre- programmed automaton, too big to change and too important to mess with. has added something exciting: she lets the teachers teach. When passionate students can start their own political movements, profitable companies, or worthwhile community projects without the aegis of a school, how are obedience and fealty enforced? You, and you alone, must make your decisions, and you must live with them. People working alone (in parallel) are far more efficient than teams. Burger flippers of the world, unite. I can’t think of anything more cynical and selfish, though, than telling kids who didn’t win the parent lottery that they’ve lost the entire game. We can’t switch the mission unless we also switch the method. Competent people resist change. Why? Because change threatens to make them less competent. And competent people like being competent. And the problem with the race to the bottom is that you might win. In a monarchy or similarly authoritarian system, there was no way in the world you were going to accomplish much of anything unless you were picked. They needed more customers. More well-trained, pliable, eager-to-consume customers watching TV regularly and waiting to buy what they had to sell. If willpower can be taught, why don’t we teach it? Simple: because industrialists don’t need employees with willpower, and marketers loathe consumers who have it. In other words, the ones who haven’t merely followed instructions. If there’s a better way to steal the desire to dream, I’m not sure what it is. Great performance in school leads to happiness and success. This relentless push for less (less intelligence, less culture, less effort) is one of the boogiemen facing anyone who would mess with the rote rigor of mass schooling. And then, when they get to Google, one of the most popular terms? Facebook. They’re typing “Facebook” into Google to get to the social networking site, because they don’t know how to use the address bar at the top of the browser to type www.facebook.com, and they don’t know how to bookmark their favorite sites. They self-describe as Dummies and give up, not for lack of genetic smarts, but for lack of initiative and because of an abundance of fear. School is successful… at the wrong thing. the problem is that kids don’t care. What we can’t do, though, is digitize passion. If you’re not already great, don’t bother showing up. Real men don’t read literature. Now, though, our future lies with the artist and the dreamer and yes, the person who took the time and energy to be passionate about math. One theory is that if you force someone to learn math or writing or soccer, there’s a chance she will become passionate about it and then run with what she knows. The challenge is that the connected economy demands people who won’t hide, and it punishes everyone else. But if it takes ten years for you to do math well, that’s too long to wait for passion. Reading leads to more reading. Writing leads to better writing. Better writing leads to a bigger audience and more value creation. And the process repeats. Among Americans, the typical high school graduate reads no more than one book a year for fun, and a huge portion of the population reads zero. No books! For the rest of their lives, for 80 years, bookless. Writing is organized, permanent talking, it is the brave way to express an idea. how to figure things out and make them happen. Easier, then, to emotionally opt out, to phone it in, to show up because you have to, because then failure isn’t up to you; it’s the system’s fault. As a parent, you see what seven-year-olds in China are doing (trigonometry!) and you see the straight rows of silent students and rigor, and it’s easy to decide that there’s a race, and we’re losing. Symbol manipulation is a critical skill, no doubt. But without the ability (and interest) in turning the real world into symbols (and then back again), we fail. If you’re unable or unwilling to build bridges between the real world and those symbols, you can’t make an impact on the world. When kids go to the mall instead of the library, it’s not that the mall won; it’s that the library lost. Post-Gutenberg, the scarce resources are knowledge and insight, not access to data. take the world of data, combine it with the people in this community, and create value. Not the male students on the team—the male students who pay a fortune to attend the University of Oregon.